It was a fairly lazy morning. This morning’s entertainment was produced by Edelweiss. The captain loaded his two large dogs into the dinghy and took them to shore in the rain. First they both “took care of business”, then bounded off into the woods and out of sight. The owner waited patiently and about five minutes later, they both returned to the shoreline and then proceeded to circumnavigate the entire bay. The dinghy followed them as they frolicked around the perimeter. Sometimes the dogs were in the lead, sometimes the dinghy. About three quarters around the bay, the older dog would pick a nice looking beach and stop, looking over his shoulder as if to encourage the owner to land the dinghy and pick him up. But the dinghy would continue and the dogs followed until they were abeam the sailboat. Only then did the dinghy put in and both dogs jumped on board. I can only imagine what it is like to be into a small sailboat with two large (and wet!) dogs. Certainly keeping them exercised like this is an important protocol for everyone’s sanity. All during this chapter of “Alaska TV” the rain poured. Thus we remained in our jammies and spent a relaxing morning doing much about nothing. We did finally get up enough energy to weigh anchor around 1 pm. As we left Seven Fathom Hole, Karen asked for a “drive by” of Jackpot Stream, where we saw a small pleasure boat happily anchored. On our way to Chenega Glacier, at the head of Nassau Fiord, we stopped at Gaamaak Cove as a possible anchor spot if the ice prevented us from making it to the glacier. Recommended by the sailors who write a blog on Alaskagrapy.com, it is one of those very small spots that goes from very deep to very shallow very quickly. You could certainly make a stop here if you picked your spot very carefully, but it didn’t’ appeal that much. The kittiwake colony was cool, though. Fortunately for use the weather is improving and the ice seems to be cooperating, so we pushed on. This glacier is one of the most active in the sound, so the approaches are often blocked with ice. We got lucky. The ice was all on the south side, so we could go right up to the glacier face on the north end. We stopped a quarter of a mile away from the face for safety, as there was a lot of calving in progress. On the south side the ice field extended one-half mile and was impassable. However, this ice field was populated with more seals than we could count. Certainly the population exceeded 500 animals. There were a couple of kayaker tents on Nassau’s north shore. And the sun came out! The trip to Chenega was certainly worth it. It has a very impressive face, and from afar you get a good look at the ice field that forms the glacier. There is even smaller Tiger Tail glacier on the south side. And as the clouds broke and the sun made an appearance, Tiger Tail was very picturesque. 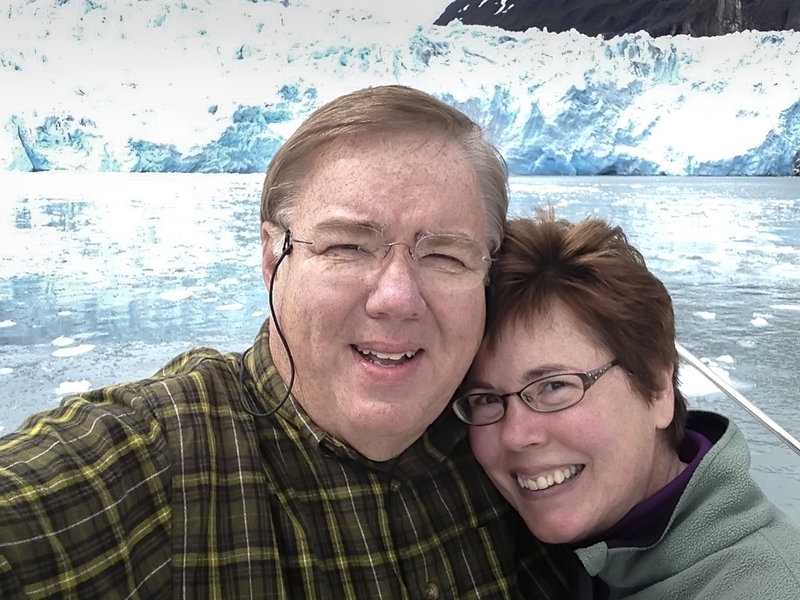 We hovered in front of the glacier for about an hour taking pictures and just taking in the majesty of it all. As we departed we idled along the ice edge so we could get a better look at the seals. We had to take one with the iPhone just to be cool "old fogies"
Departing Nassau Fiord we spotted two kayaks that gave us a call on the radio as we approached. They were looking for a weather report and we were able to brighten their day as the forecast was for calm weather for the next four days. The next fiord to the south is Whale Bay and despite its name, no whales were seen as we approached its head, called Humpback Cove. On the way to the bay, we saw a landing craft from “Epic Adventures” dropping off kayakers at Dual Head. It was totally sunny, with few clouds…actually quite warm! There is an old moraine that protects the anchorage, but if you pass over the moraine at 90 degrees where it is marked “15 feet” on the chart, you’ll see that depth on your sounder. It’s wild to look at the sounder sonar picture of the bottom, how it rises dramatically and then just stops right at 15’. Once inside, there are plenty of places to drop anchor and enjoy the rich scenery. Marshes, riverbeds, waterfalls and snowy mountains all fill the view. The clouds continued to retreat and before long we were treated to a cloudless sky, something rare around these parts. The only downside was that with the heat and lack of breeze, it was a bit buggy outside. We had a quiet evening at anchor, with little breeze and absolutely no fetch.